Oscars: Best Picture, Director, Adapted Screenplay (Michael Blake, from his novel), Cinematography (Dean Semler), Editing (Neil Travis), and Sound. With Graham Greene as the solemnly humorous Kicking Bird, Rodney Grant as the hotheaded Wind in His Hair, Maury Chaykin, Floyd Red Crow Westerman, Robert Pastorelli, Wes Studi, Charles Rocket, and Larry Joshua. Kevin Reynolds shot second-unit material (including the buffalo hunt). A longer cut running 237 minutes is available on home video, and is the version usually shown on TV. 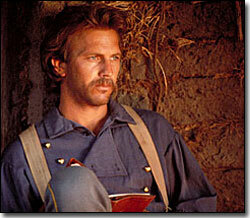 Costner didn’t direct again until 1997’s The Postman.